Near the end of 2017, the food pantry at West Des Moines Human Services implemented a new “food pantry 2.0” system. Rather than a set number of food items families may receive per month, pantry visitors at West Des Moines Human Services are given a number of points to spend on their items. Healthy food choices are given lower point values, providing the opportunity for people to get more food if they select healthier options. The new system also allows visitors to come multiple times throughout the month to use their pantry points. Jenn Danielson, Vicky Arroyo, Dawt Zi, Kristan Honts and Briana Jenkins all have something in common. They each go to West Des Moines Human Services to use the food pantry service to help provide meals for their families. They each have their own stories, and own personal backgrounds. Danielson had to go on disability due to a surgery. She has visited the pantry about four or five times, and made note of the change in the way things work at West Des Moines Human Services. “I appreciate it’s available especially the vegetables, because I don’t eat meat…before the vegetables were canned and now it’s nice to have choices,” Danielson said. Danielson had also expressed appreciation of the volunteers that work at the food pantry, and noted on the positive impact the pantry has had on her standard of living. Arroyo said that she has been visiting the pantry every month since 2008. She mentioned that the point system that has been introduced in DMARC’s Food Pantry 2.0 system is better than the previous. “It’s made a difference, now we can actually get some fresh vegetables and fruit. I always get things and make dishes based off my background,” Arroyo said. She also went on to mention that what she makes may depend on what her kids might want. “I like to cook different backgrounds [too] such as Asian food, or do some pasta, some Italian food,” Arroyo said. Zi has been coming to West Des Moines Human Services for two years every month, once or twice each month. Zi doesn’t know how to cook American meals, so the introduction of fruits and vegetables has helped her a lot. “I’m eating more traditional Asian food…the fruit is fresh and better,” Zi said. Honts is taking care of her grandmother and has been visiting the food pantry for a couple years. She helps make sure her grandmother’s house is clean, that she receives her medicine and that she gets meals. The changes haven’t affected their eating habits, but they’ve helped them receive more assistance to make it through the month. “[Without the food pantry we] probably wouldn’t eat a lot of our meals. [It supplements] two out of three of our meals. I usually just try to use up the points, so I don’t have to use gas to come back,” Honts said. 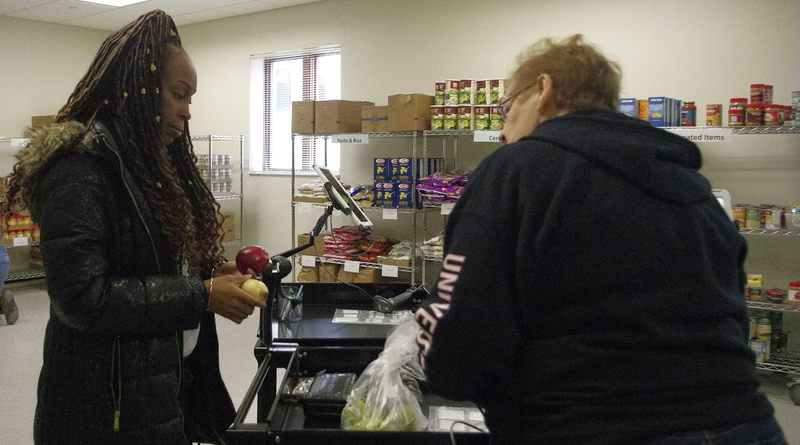 Briana Jenkins (L) selects some fresh produce for her family at the West Des Moines Human Services food pantry. Jenkins, a Chicago native that has moved to Des Moines to try to make a better life for her children, has been visiting West Des Moines Human Services monthly since 2013 off and on. She has had a plethora of different jobs while living in Iowa, and has been in college, but has had to put a lot of her endeavors on hold to help sustain her family. “I’ve noticed a change in how the whole system is set up…they’ve introduced more healthy items, and I’m more interested in healthy eating,” Jenkins said. Danielson, Arroyo, Zi, Honts, and Jenkins all have their own backgrounds, but West Des Moines Human Services and the DMARC Food Pantry Network has helped them sustain their lives regardless of where they come from. 1 Reply to "Different Users, Same Results"
Thank you so much, all of you running DMARC, for helping all these people get good healthy food for all these years. I am a member of St. Andrew’s Episcopal Church, where we are inspired to contribute to DMARC as an important ministry, in part because we share our building and offer support in a variety of way (free ESL classes, coaching to becoming US citizens) to immigrants from Africa.